It’s interesting to hear how some musicians have a love/hate relationship with YouTube videos. Aside from the never ending entanglement of intellectual property issues, it’s surprising to hear their criticisms or even outright embarrassment about some performances, particularly ones that people rave about. I have a confession to make: I buy CD’s from bands when I can, but I honestly don’t enjoy most of them. There’s an edge to a live performance that studio recordings can’t replicate, and many of those times, the errors and off notes contribute to that visceral feel. I once forwarded a video of a performance that I enjoyed tremendously to another musician to get some technical feedback on it, and was surprise to hear how many flaws were present. Looking back, it’s hard to not concede these points, but I also can’t forget getting caught up in the rush of being there. I think that’s why we've seen a rash of live CD’s this year including Glenn Crytzer’s Skinny Minnie: Live From Midwest Lindy Fest and Gordon Webster’s “Live In Rochester.” Gordon also appears on the new “Tuesdays At Mona's” which he recorded with Mona’s Hot Four and friends at his semi-regular appearance at a bar in New York city which has become a gathering place for NYC’s up and coming traditional jazz musicians. Meanwhile, Durham, NC’s Mint Julep JAzz Band is working on a kickstarter campaign to record their own live cd after getting rave reviews from their appearance at this year’s Eastern Balboa Championships. In the end, I think many musicians also acknowledge that there are benefits to the free publicity. Just this year, Gordon Webster played Switzerland, Barcelona, and Stockholm. The Boilermaker Jazz Band played in Korea. There were 600 people jumping and screaming for more at DCLX’s Battle of The Bands with most of the crowd’s ages ranging from teens to 30’s. Dance gigs also connect musicians from across the country in ways that they would not think to do on their own. Ask a veteran traditional jazz musician, and you’ll quickly discover that these things are not supposed to happen. Most of them are usually confined to gigs in their home cities, and possibly a festival or two if they’re lucky. That there now exists a somewhat viable tour circuit through the dance community is a bit of a freakish development. This isn’t surprising if you look at the past 10 years of Lindy Hop, where it becomes apparent that the dance community (on the national/international level at least) is now nearly inextricably linked to classic swing era influenced jazz music through like minded jazz musicians. It started with Amy Johnson bringing in Josh Collazo & His Feetwarmers for the first Ultimate Lindy Hop Showdown and Hilary Alexander working with Jonathan Stout to bring his various bands to Camp Hollywood. Since then we've cultivated relationships with The Boilermaker Jazz Band, Gordon Webster, The Carling Family, Meschiya Lake, and many others. I’m actually in the process of researching this newer generation of jazz musicians and discovering that there is so much talent out there. That’s not to marginalize the work of those who came before such as George Gee, Bill Elliott, Dean Mora, and Tom Cunningham, but there is definitely a level of collaboration and mutual admiration that has quickly evolved in the past few years. When the Neo-Swing era hit in the late 90’s, it didn't take very long for those bands to start resenting its new found fan base. Some of it was justified in that they felt their music was marginalized by the wildly kicking masses who drank too much water in the bars and clubs they played. There were even some instances of bands preferring to play at venues that didn’t allow dancing at all to get away from what they considered unnecessary distractions from their music. As the gulf grew between musicians and it's primary audience, it didn't take long for neo-swing to be shuffled into the dust bin of pop culture history. In looking back to the past for inspiration, Lindy Hop re-matured as a dance and Lindy Hoppers became more fluent in the language and history of jazz. This enabled them to identify and connect to the kind of music they want to dance to, and musicians started recognizing this. I remember a night after a dance when the bassist for The Boilermakers, Ernest McCarty, came up to us afterwards and declared us “Artistes!” Granted, this was a time when DC has home to dancers like Naomi Uyama, Nina Gilkenson, Skye Humphries, Andy Reid, Mike Faltesek, Stefan Durham, and Bethany Powell among others. However, I think this was an important acknowledgement especially coming from a man who has played music for over 50 years and studied with master songwriter Stephen Sondheim, and toured with legendary pianist Errol Garner. Bandleader Paul Cosentino left us an open invitation to work with his band which resulted in this performance by the Jam Cellar at the 2006 DC Lindy Exchange. A year later Amy Johnson, brought the Loose Marbles to play at ULHS for the first time. They eventually became one of the first bands to bring dancers along on its tours on a regular basis. That band spawned several others including The Baby Soda Jazz Band and Meschiya Lake and The Lil’ Big Horns, which are now constant fixtures at Lindy hop events across the country. In addition, there has been a crossover of dancers taking up instruments and starting their own bands including Solomon Douglas, Glenn Crytzer, Mike Faltesek, and Jonathan Stout. The end result is a vibrant two way communication of expectations and appreciation. I think the transformation of the relationship between dancers and musicians as creative equals rather than customers and service providers has created a stronger bond between the two groups. I don’t miss the days of dancing to musicians who felt like they’re slumming for the night by lowering themselves to play at a swing dance. Those nights, you can smell the disdain coming from the bandstand. More than anything, I believe it’s that underestimation of the audience that kept dancers from really connecting to the music. That is not a fun feeling to dance to, so it’s great to have all this awesome music to dance and listen to now. I rarely travel for dancing, but the combination of Meschiya Lake and Gordon Webster was enough to entice me to go to Boston in September for the Dirty Water Lindy & Blues Exchange. They did not disappoint. Over the years, exchanges have dropped in priority for attendance for veteran dancers like myself. However, the events that continue to thrive are the ones that have transformed into pseudo music festivals, showcasing the best music around such as the exchanges in Austin, Seattle, DC and Pittsburgh. The Mobtown Ballroom celebrated its first anniversary by featuring Meschiya Lake & The Lil Big Horns for two nights with no other dance related activities. This is unheard of for an event primarily targeted at Lindy Hoppers, and they still ended up drawing people from up and down the East Coast. If I ever have the shot at revising “Artistry In Rhythm” I’d definitely devote more time to exploring this relationship with current jazz musicians as one of the main threads in the development of modern Lindy Hop. Until then, enjoy some good music. The video at the top of this post is a playlist which is designed to cycle through some of the performances I’ve enjoyed in the past year. Since I can’t get around to every event, feel free to add your own in the comments below. Some linear notes on selected highlights of the highlights. Skye Humphries & Naomi Uyama performing at Uptown Swing Dance with the Gordon Webster band: Technically from 2011, but I caught it too late to include in any lists last year. Still, a great example of the collaborative relationship between dancers and musicians. Andrew Nemr performs with Adrian Cunningham at Stompology VII As far as we’ve come though, we still have a ways to go as illustrated by this spectacular duet. This year has seen some great combinations of musicians working with each other. Boston Swing Central brought Meschiya Lake together with Gordon Webster earlier in the year. That proved to be so popular that they reunited for a double header at The Dirty Water Lindy & Blues Exchange that brought the house down. Gordon played both the main dance and the late night dance on Friday AND Saturday that weekend. He capped it off by accompanying Carsie Blanton at the late night. Right before she went on, the Boston dancers performed their team routine to her hit “Baby Can Dance.” Carsie completed the circle of inspiration by ending her set with that same song. The beginning of the year saw some great music come out of Lindy Focus. They did New Year’s Eve up right with the Jonathan Stout Orchestra in which he augmented his Campus 5 with talented North Carolina locals and two members of the Boilermaker Jazz Band: Gerry Gagnon on trombone and Paul Cosentino on clarinet and saxophone. The highlight of that night for me was the duel between Paul on clarinet and Campus 5 tenor saxophonist Albert Alva during the Dark Eyes jam. Point of trivia, I was standing next to the guy taking this video and tapped him on the shoulder so he could catch the action between these two of the fine reedmen. Then there’s this appearance of Glenn Crytzer sitting in with The Boilermakers at SparX. Here they do a rare small group version of Cottontail for the J&J finals. Or at least rare for the Boilermakers. Later you heard Paul joining Glenn’s Syncopators along with Midwest jazz stars Dave Kosmyna and one of my favorite jazz drummers, Steve Fentriss. Glenn brought another star studded band to Midwest Lindyfest. My highlight from that weekend was their version of Egyptian Fantasy with the talented Evan Arntzen on clarinet. That’s not online but you can get it through the live album he recorded there. I also got to hear my favorite swing guitarists, Robert Bell at Midwest Lindy Fest, leading his own Twin Cities Hot Club playing for each individual spotlight of the MWLF Invitational J&J. I had this version of Rosetta stuck in my head for weeks afterwards. Before MWLF, Glenn Crytzer brought an all star band to DCLX this year to defend his Battle of the Bands trophy, assembling a loaded line up including Bria Skonberg and Dan Levinson from NYC, Jason Jurzak and Meschiya Lake from New Orleans, and Lucian Cobb from North Carolina along side DC's best including Anita Thomas. Crytzer unleashed a few surprises including a version of Communication inspired by Jo & Kevin’s performances. His opponent, the cagey veteran Tom Cunningham, gave as good as he got, unleashing the full power of a 17 piece big band as you can hear with their furious version of “Airmail Special.” They then combined for a 30 piece collaboration on Cottontail which featured a tenor saxophone duel between rising stars Patrick Breiner and Ricky Alexander. I’m unapologetic for being a hometown guy by featuring DCLX a lot, but all the bands turned in great performances including DC’s own Bitter Dose Combo which showed the new and the old can coexist together with their version of Minor Swing/I Will Survive. Not to be done in the all star big band department, Jonathan Stout assembled and arranged for a special version of His Rhythm Busters at this year’s International Lindy Hop Championships. The band consisted of members of his own Campus 5, The Boilermaker Jazz Band, and DC locals including Blue Sky 5. They tore it up for both the Champions and Invitational Strictly finals. I should also note that the night before, Paul and Gerry of BMJB reprised their Lindy Focus appearance with Jonathan Stout for a great night of music including a version of Blues My Naughty Sweetie Gives To Me that was so nasty that I had to put down my camera to go dance to it. I did get to record the Boilermakers playing “Pure Imagination” from the Willie Wonka soundtrack. 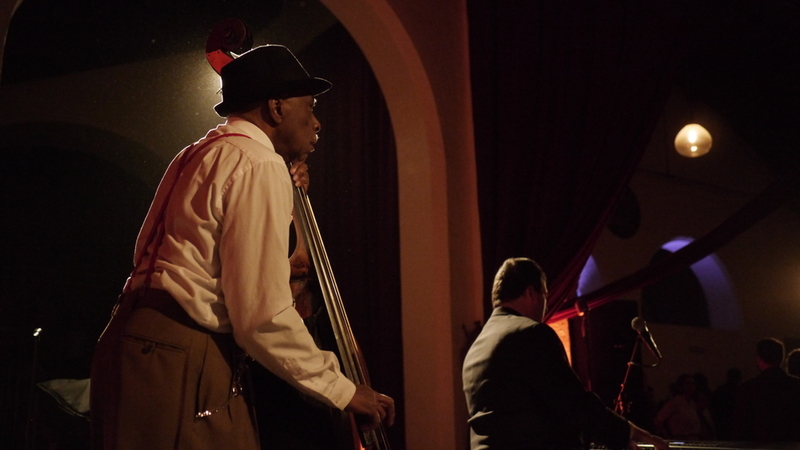 They’ve done it a few times and it’s a wonder to hear Paul's delicate treatment of the melody and Ernest’s masterful work on the bass proving that you don’t have to completely abandon all modern jazz conventions for dancers to enjoy a swinging song. The Careless Lovers played a searing hot blues final at The Lone Star Championships with a band that included some of Austin’s finest as well as New Orleans stalwart, Ben Polcer who usually plays with Meschiya Lake. The Seattle based Careless Lovers also had a nice collaboration with two dancers, Hannah Mackenzie-Margulies and Nirav Sanghani, who also live in separate cities. They all got together to perform a number at a forth city during the Albuquerque Lindy Exchange. Meschiya Lake and The Lil’ Big Horns were all over the country this year. They played most of this year’s Jump Session Show and were the centerpiece for the Mobtown Ballroom’s First Anniversary. This will have to make up for the two dirtiest blues songs Meschiya sang as part of the Mobtown Ballroom’s Variety Show that weekend. they had lyrics so nasty that I doubt they'll make it online any time soon. On the other end of the spectrum was Gordon Webster getting Aurora Nealand to sing “His Eye is on The Sparrow” to cap his set at Bambloozled. It was one of the most beautiful musical moments I’ve had the pleasure to experience in person. Finally, I’m sure ULHS had so many musical highlights that didn’t make it online, I don’t know how people can stand it. I had a hard time choosing from the many competition, performance, and social dance did get recorded. One day, I’ll get there. There are more clips on the playlist. Leave it on in the background. You won't regret it.